eVolt UK, the nationwide supplier of electrical vehicle (EV) charging units, has installed the latest versions of its rapid charging units for a new hub to help Dundee City Council promote electric taxi use. eVolt has installed four Raption 50kW Rapid Chargers and three 22kW eVolve chargers at the new hub at Aimer Square. The Rapid Chargers are capable of charging two vehicles simultaneously at full power in approximately 30 minutes. This is the first of three rapid charging hubs to be introduced in Dundee in 2018 through the Office for Low Emission Vehicles (OLEV) Go Ultra Low programme. Dundee City Council selected the locations based on commuter routes and also following a questionnaire sent to the city’s taxi drivers considering their opinions on where the hubs should be sited. 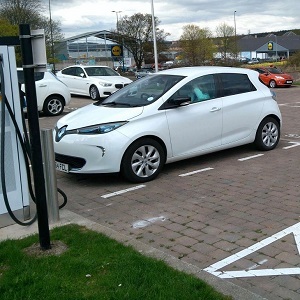 Fraser Crichton, Transport Officer at Dundee City Council, has been encouraged by the early usage of the units: “The Rapid Chargers have been in use at Aimer Square since the beginning of April and have already been used over 700 times in the 10 days since opening, including over 100 different users. There are currently 94 pure electric taxis in use in Dundee and we hope to see more drivers make the transition.